Leave the expensive brunches and Airbnb staycations to the lovebirds. Free yourself from the chains of Valentine’s Day this year and join us at Littlefield on Friday, February 12th, as we celebrate those who fly solo. Wear black on the outside, ‘cause black is how you feel on the inside. No, seriously: Dress in black. All black. Only black. Creativity will be rewarded. All through the night, we’ll have the suitably-named DJ Gordon Gloom (Feeling Gloomy, YDH2S) spinning music you can dance to with someone you love (yourself). Nothing like a little Depeche Mode for embracing your depressed mode, or The Cure to medicate your cabin fever. 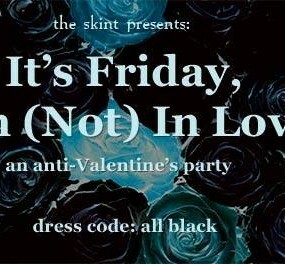 With $5-8 drink specials you can actually afford — since you’re not paying for someone else anymore — and cheap admission ($5 in advance and $8 at the door), you’ll end up spending way less than you would on flowers, chocolates, and other stuff that those “happy” people in relationships do. By the end of the night, you’ll forget all about ‘the one who got away.’ And their cute friend. And that one Tinder date. Dark surprises await so leave your morals and standards behind. Just because we all die alone doesn’t mean you should go home alone.